With the New Zealand commerce environment becoming increasingly cut-throat, first impressions of your business are becoming increasingly important to gain a professional lead over your competitors. Produce a professional impression with expert stationary and promotional items! Excellent value for money! To be successful it is now vital to present a strong visual identity of your business. Your business letterhead is a critical part of your visual identity. It should present a professional business identity to your clientele and possible customers, as others can notice its style as the professionalism of your organization. The quality and clarity of the print and colours is important. If the promotional message and logos are well worded, but the print quality and the card used is of low quality, then the impression left may be somewhat negative. However if the print quality is sharp, vivid and crisp and the card used to print on is of photo quality finish, then the impression left is bound to be positive. Letterhead and business card design can frequently be the first task of a company’s new graphic identity. It ought to transmit significant sales messages to your customers. A artistically designed style gives your business that all-important competitive edge and ensures your company image and marketing messages are well received. 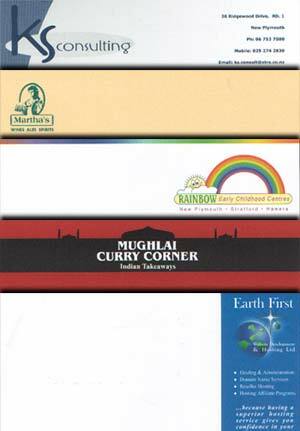 That is why we will make certain that your professionally designed business stationery is printed on the best quality stock and precisely reflects your company’s services and/or products. The print quality is sharp, clear, crisp and photo quality. All our print work comes with a peace of mind guarantee, to further put your mind at ease. 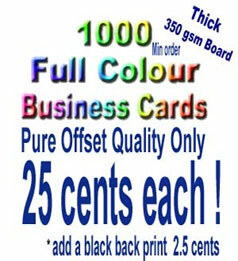 The above pricing is for file supplied in a format we can work with. For an investment of $59 plus gst We can design your new letter head. Please Note : This does not include logo design.